In an emergency, medical information contained in your ER-Quik kit may save your life. Communicate critical information to doctors and emergency room staff quickly and accurately even when you are unable to do so. 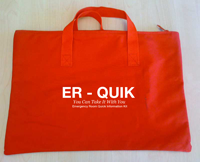 ER-Quik, a simple workbook in a bag, assists you in documenting your personal medical history. 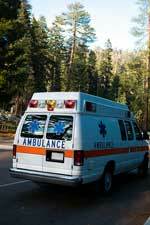 Your personal medical history is ready to be easily transported in any medical emergency. The sturdy ER–Quik bag has ample space to transport your medications. Leave nothing to chance or memory. Just grab your bag and go! Save precious minutes searching for medical information. Complete the questions presented to you by a practicing Emergency Room doctor. Your answers to the most commonly asked questions in a real medical emergency will be at your fingertips. Communicate critical information to doctors and emergency room staff quickly and accurately even when you are unable to do so. © 2010 LLM Solutions, LLC.